Professor Clampitt’s Hall of Fame. We all know what it is, we all want to be in it (I know you do, don’t lie.) But, what can we do to help get us to that level in the Communication Department? Is it knowing what your professor wants to hear, or is it who you work with? Let me tell you, it’s much more than that. Here are five ways to get yourself to the Hall of Fame. There is nothing that Professor Clampitt likes more than seeing students think strategically. Yes, it is our instinct to think about tactics, but guess what: your tactics are more-than-likely strategies at this point in the game. You have learned so much from so many classes that strategy is ingrained in your brain. You may not believe it, but it’s there, trust me. A tactic belongs at the end of the line. If you can expand more, BAM – you’ve got yourself a strategy. So, dig that strategy out and earn yourself a hearty head-nod from Professor Clampitt. #2: Work with people you know. I know, I just broke the cardinal rule of Group Making 101, but hear me out. It’s important to expand your horizons and get to know as many people in your major as possible: I understand that. However, when you’re striving for the Hall of Fame, you want to be working with people you trust and who are on par with your skill level. If you and your best friend work together well, get in the same group. You’ll have a better experience and a much higher chance of earning a spot in the hall if you are working with people you trust and like. Remember those 100 Facts you randomly threw together because you needed them as part of your paper? Yeah, those matter. They matter quite a bit. Research sets you up to succeed with your project. Knowing your case, person, or organization like the back of your hand will lead you one step closer to being accepted into the Hall of Fame. No matter how dismal completing that research may be, you’ve got this. Grab some popcorn, fuzzy socks, and a glass of rosé and you’ll be fine. It can even be kind of fun, I might say. Let’s be real, being a Communication major is hard. You need to know time management; you need to know how to think differently than your peers. But your classes are going to get progressively harder each semester. You shouldn’t be worried about that. You should be excited, because harder classes mean that you’re ready to take on more, and that you’ve learned enough to launch you into your next case. Our professors expect us to exceed their expectations, as lofty as they might be. But knowing that you have challenges coming your way and readying yourself to face them will put you in a much better place when you stumble across a tricky scenario. Take the obstacles one step at a time, and you’ll complete them – even if it involves a casual mental breakdown. You’ve got this. P.S. : no one gets to the Hall of Fame by giving up. The Titans were inducted into the Hall of Fame in March of 2017 for their work on a simulated Volkswagen public relations plan. Image courtesy of UW-Green Bay. Ah, there it is. The word every one of us has heard more times than we care to admit. Professionally, professionalism, being a professional. Let me tell you, that is vitally important, at least if you want to get a spot in the Hall of Fame. Being able to present your findings and argue for your brand professionally will earn you millions of virtual candies. 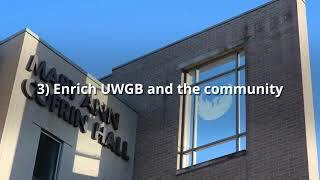 Not only does this program strive to teach students the ins and outs of specific communication fields, it also works to ensure that each of us leaves UWGB understanding what professionalism means. Knowing how to write emails, asking and answering effective questions, using verbal and non-verbal skills are all huge. The Hall of Fame gives examples of ways our peers used professionalism in their projects. So, put on your blazer, and use proper greetings in that email – it means a lot. This isn’t an all-encompassing list of ways to get into the Hall of Fame. In reality, you’ll need motivation, a good group, and lots of wine. These are simply my tips for you. Take your challenges as they come, and never forget to sign your emails. The Hall of Fame isn’t just there to admire exceptional work of other students. Use it as a tool. Find examples, take notes, learn from others. Now go forth, and earn those virtual candies and head nods from Dr. Clampitt. You’re only a Communication major once, after all. Next Post - Next post: Ready for a Capstone?